Opposite Brodarica there is the smallest (0.36 square meters) and most densely populated island in the Mediterranean – Krapanj, which is only 300 m away from the mainland. This island has typical Dalmatian architecture - narrow stone houses and narrow streets. The brave people of Krapanj have preserved the 300 years old tradition of sponge harvesting - catching and processing sponges. The monastery of Sv. Križ [St. Cross] is a museum that has a collection of sponges, corals, amphorae and antique tableware. The monastery preserves other valuable protected artefacts (a painting of The Last Supper, the Black Madonna on the Throne). Many of the Adriatic Islands were populated in pre-history by the Illyrians. Krapanj however was first populated by Croatian Toma Jurić, a nobleman from Šibenik and a descendant of the Šubić family from Bribir. 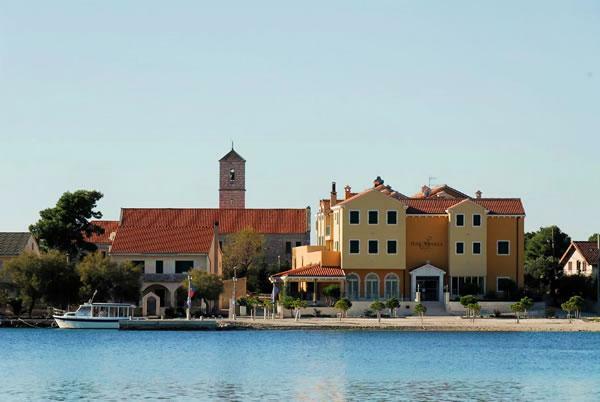 Jurić purchased the island in 1436 from the Šibenik County with the intention of building a Franciscan church on the uninhabited island. Realising their father's dream after his death, Jurić's 4 sons completed The Holy Cross Church and monastery in 1523 with blessings from Pope Eugene IV on one condition: only the Friars were to live and inhabit Krapanj. 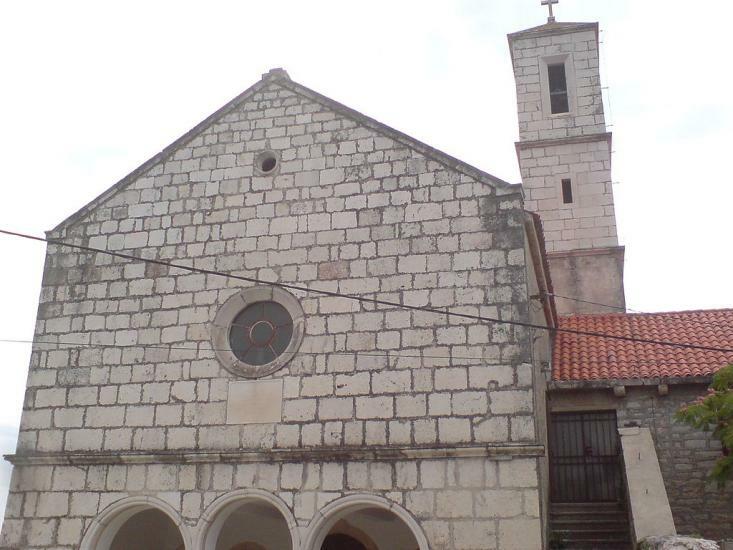 Krapanj came under the possession of the Franciscan Province of St. Jerome of Dalmatia in the 16th century as the Ottoman Empire invaded neighbouring lands. The Franciscans allowed people living on the neighbouring mainland to build their own settlement, southeast of the monastery who then united to defend themselves against the Ottomans. Since the work of the Franciscan friars was closely connected to the inhabitants of the island, in 1652, the monastery was given a parish and the friars began offering spiritual and other assistance to parishes on the mainland. The remains of the old church walls, in part, can be seen by the front door of the cloister. The church was expanded in 1937, and the wall bearing the consecration date (May 15, 1523) joins the new church building with the cloister. 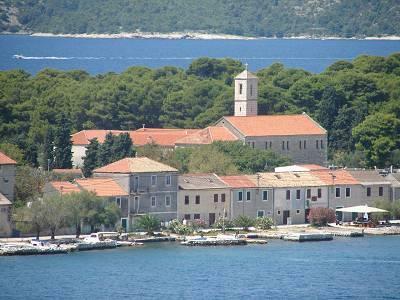 Krapanj was the most densely populated of all Croatian Islands given a lucrative economy. But from the middle to late 20th century, many inhabitants fled communism and poverty by emigrating to Australia, Canada and the USA. Adding to the trend of depopulation, the population decreased from 1,767 in 1981 to only 237 in 2001. 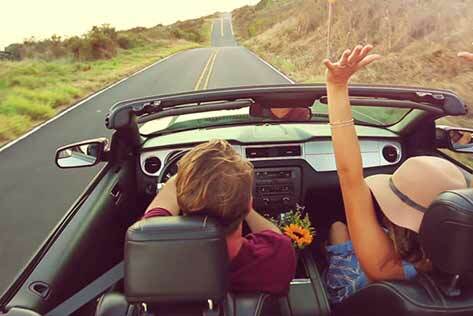 Krapanj: What to do / What to see? Krapanj has a rich history in deep sea diving, primarily in the harvesting and selling of sea sponges. Antun from Crete introduced Krapanj's inhabitants to diving and sea sponge gathering/processing over 300 years ago. For many years, diving for sponges had been the major income for Krapanj families, earning them the title of "Spužvari" (sponge vendors). By the middle of the 20th century the industry peaked with the inception of breathing apparatus and motorised boats. Crews would generally dive 6 times a day, over 20 days taking turns one at a time at depths of over 40 metres (131 feet). It was a dangerous occupation as just the weight of the suit was 100 kg (220 lb) and the constant danger of decompression sickness discouraged generations to come. The small industry still persists, with sponges from Krapanj sold throughout Europe with a primary market in Greece and Italy. The cosmetic market has in recent years opened the market for Krapanj sponges on an international scale. 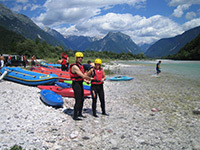 The tradition of diving has in latter days given rise to scuba diving, free diving and spearfishing professionals from Krapanj. The Krapanj monastery museum permanently exhibits a show on sea sponge diving. Krapanj is not on the tourist map. 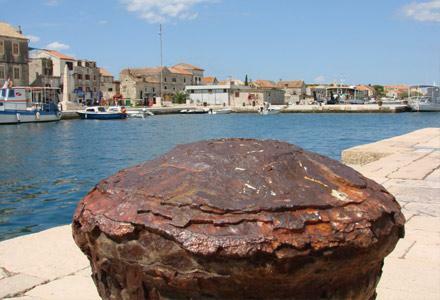 Since the end of the Croatian War of Independence, the island has begun a slow rebuild. Many of its old terraces have either been restored or are in the process of rebuild under strict heritage by-laws. This has started a steady stream of tourists to the island which now supports a certain level of tourism infrastructure. 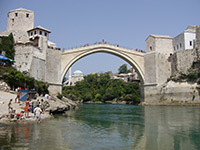 Many other Adriatic Islands have constructed bridges to allow tourist access via car. 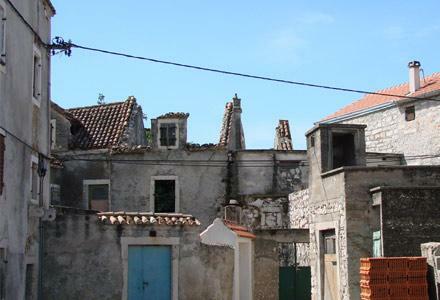 Krapanj has made the decision not to connect to the mainland as this would destroy the island's heritage.